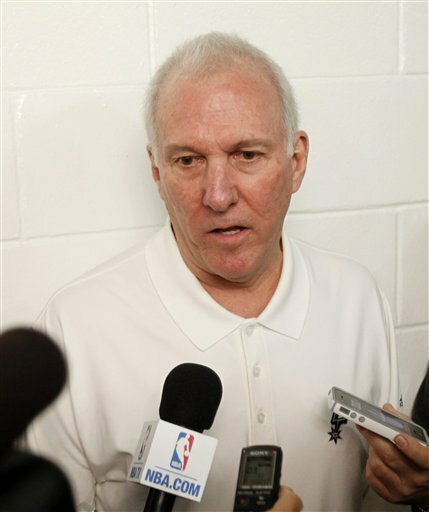 On Thursday night, Spurs coach Gregg Popovich decided not to play Tim Duncan, Manu Ginobili, Tony Parker and Danny Green on Thursday night against the Heat in Miami and chose to send those guys back to San Antonio. Popvich said it was in the team's best interest to rest their core players at the end of a road trip in which they have played six games in eight days. Naturally, David Stern doesn't like it and vows to sanctions the team, which is flat-out ridiculous. You want to know why Stern is pissed off at Popovich resting his key players tonight? Because it was a nationally televised game on TNT against a very high profile club. That is the reason, because a lot of eyeballs would be watching the game, which was a really good one regardless, nationally televised games mean a lot of money in advertisements and all that. If this was just a mundane Monday night game against the Kings on local TV, guaranteed Stern and the league would not have any problems. That is why Stern said it was an "unacceptable decision" and thus vows sanctions are en route. But here is the thing, why is it a problem if Popovich chooses to rest his players? It's a game in late November, the season is barely a month old. And it's not like the Spurs have not done this before, they did it at the end of last season and even Popovich went with them back to San Antonio! Sure, it is unfair for folks who go to the games and expect to see star players only for them not to play but you know what, if coaches decided to make decisions based on the fans, we'd be seeing alley oops off the backboard all game. Is it unfair to them? Yes, but should that really matter? What shows perfectly how the league is completely full of crap in this case is that back in April, deputy commissioner Adam Silver said that the "strategic resting of particular players on particular nights is within the discretion of the teams." But I guess now if teams want to rest their starters, they have to clear it with the league first. Or maybe just for nationally televised games.